In large resealable food-storage plastic bag, mix all ingredients except beef. Score beef crosswise by making cuts 1/2 inch apart and 1/4 inch deep (beef will absorb more of the marinade and cook more evenly). Place beef in bag; seal bag and turn to coat. Refrigerate 2 hours to marinate, turning bag once after 1 hour. Heat gas or charcoal grill. Remove beef from marinade; reserve marinade in 1-quart saucepan. Pat beef dry with paper towel. Place beef on grill over medium heat. Cover grill; cook 10 minutes. Turn beef; cover grill and cook 10 to 15 minutes longer for medium-rare (145°F). Cook 2 minutes longer for medium (160°F). Meanwhile, heat reserved marinade to boiling over medium-high heat; boil 3 minutes, stirring frequently. Remove and discard garlic. 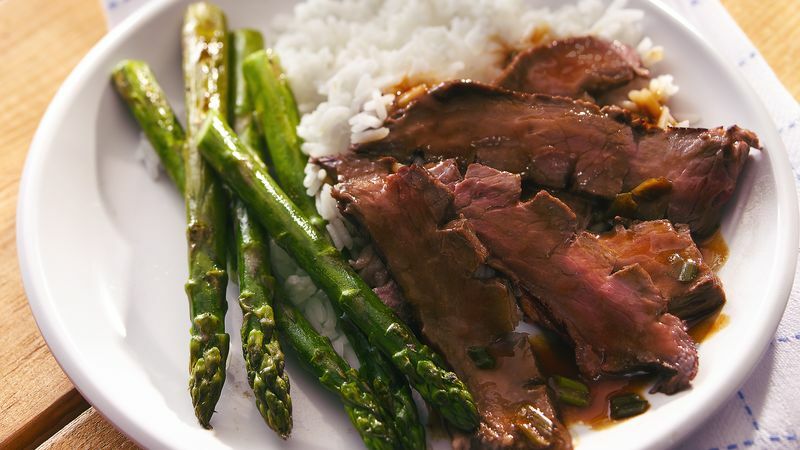 To serve, cut beef into slices; spoon sauce over beef. A quick way to peel fresh gingerroot is to scrape the skin off with the edge of a teaspoon. Any type of quick-cooking steak, such as strip or skirt, can be used.